Hipmunk, the winner of Travel + Leisure’s Best Travel Websites 2011, is known for their lovable logo and their commitment to removing “agony” from travel planning. “We wanted to find a way to give people the best high level understanding of results and make it easier to mentally narrow down what the best options are,” said Adam Goldstein, co-founder and CEO, Hipmunk. I sat down with Adam to ask him about his thoughts on travel technology, the success Hipmunk’s had with QPX over the past year and a few other personal thoughts. What have you done with QPX that has helped differentiate Hipmunk or been really popular with your users? 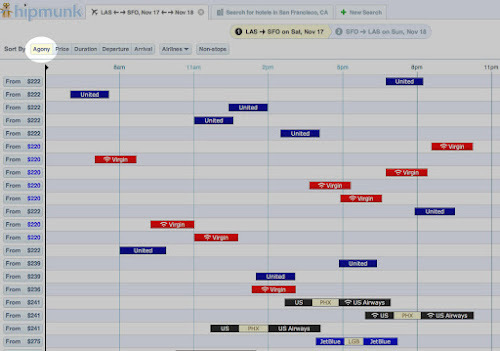 Integrated airfare shopping results with Google Calendars. QPX lets us enable people to specify what they want and what they don’t want at the time of search. They can use special routing notation to search for certain airlines, cities, flights -- or even specify cities they don’t want to connect through, maybe because those airports are known for having terribly long layovers, frequent delays or weather issues -- all to return the most relevant search results right away. This has been pretty popular with frequent fliers. Another thing that’s really popped is the ability to interact with people’s calendars. When users log in, they can integrate their Google Calendar with Hipmunk to easily see which flights fit within their schedules. QPX powers that flight search and is super flexible in supporting this integration. How has Hipmunk benefited the most since working with us? The quality and speed is great! This applies to the results we return to users as well as the speed in which we’re able to roll out changes to our site. We talked about the Boombox integration earlier -- but it’s nice that our users benefit from new features more often when we don’t have to worry about implementation. What change in technology has had the biggest impact on the travel industry over the last decade? The biggest impact? Probably smart phones. We recently saw our first day in which our mobile usage exceeded web usage. Even absent any macro trends, people are finding mobile experiences to be much more seamless and important. And, having the same power on your phone as you do on a desktop is incredible -- especially if you’re stuck in an airport and need to find a flight out. I think more and more of the technical power and experience we have on our mobile devices will migrate to desktops as well. What have you learned about the travel industry that surprised you? There are a lot of big companies in this industry that are slow to adapt to change. The systems and websites of some airlines and suppliers make engineering changes extremely slow. We’re really fortunate to be able to iterate as quickly as we do. What's the funniest thing that's happened to you while traveling? That depends on your sense of humor. I’ve been stranded and have bumped into people I know half way across the world, in Buenos Aires and Hong Kong. But, one especially funny incident; we were in Turkey, driving through the countryside between two cities about eight hours apart -- basically, in the middle of nowhere. We saw a restaurant called Mantar Evi - which means Mushroom House. It sprung up pretty randomly, and the entire menu was all mushrooms. I was pleasantly surprised. Honestly, it was the most delicious and best meal we had on our entire trip. Check it out if you’re ever in Korkuteli Turkey. Hipmunk has been a great team to work with over the past year plus! I’m looking forward to helping them come up with new ways to remove “agony” from the travel planning experience. You can learn more about Hipmunk on their Google+ page.